Russian scientists confirm the discovery of new "mysterious holes" on the Yamal peninsula, similar to those observed from a helicopter in 2014. Russian scientists are ready to confirm the discovery of only two new "mysterious holes" on the Yamal peninsula in Russia's far north, although there is information on the internet about an entire deposit of orifices. 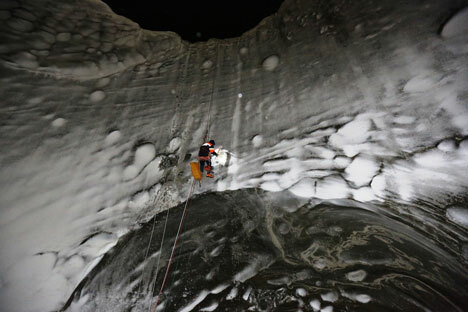 "I can confirm only two new holes, but this is not a scientific confirmation because, judging by the photos, the holes are a bit different," said Marina Leibman, doctor of geo-mineralogical sciences at the Institute of the Earth's Cryosphere at the Siberian Branch of the Russian Academy of Sciences (RAS). "One of them is almost half filled up with water. The walls of the second are also different from the orifice we studied last year." Leibman was one of the scientists who in 2014 took soil samples from the enormous orifice that was seen from a helicopter 30 kilometers away from the large Bovanenkovo gas deposit. "There was a lot more ice in the soil samples we took last year than had been expected," said Leibman. "This explained, for example, why there was a small mound around the hole and where the other soil was. We still can't say what type of gas exhausted the soil, since we still have not devised a way to confirm it. But so far our only theory is that it was gas." According to this version, factors that still need to be determined may show that under heavy pressure the accumulated gas under the sheets of permafrost emitted a layer of soil. The fact that it was a cold explosion is explained by the breastwork (mound) of expelled soil that formed around the orifice, as well as by the absence of traces of burning. Vasily Bogoyavlensky, a doctor of technical sciences at the Institute of Oil and Gas at RAS says that scientists know of the coordinates of four other holes and he believes their numbers will increase. Where are the holes from? In Bogoyavlensky's words, the "mysterious holes" that created such a sensation on the internet do not have well-known analogues on land, but can explain the serious degradation of permafrost. Famous "analogues" have been seen only at the bottom of arctic seas, but they also, in Bogoyavlensky's opinion, have not been fully studied. This seabed apparently has the same geological structure as the Yamal land, with one exception: the land is covered by a thick layer of permafrost, which has practically disappeared in the northern seas. "A large part of today's Arctic seabed was land with permafrost 10,000-15,000 years ago," says Bogoyavlensky. "Furthermore, an enormous territory was covered with a powerful glacier, a piece of which has been preserved in Greenland. Currently, a substantial part of the paleo-permafrost zone in the Barents and Kara seas has melted. In some areas the frost has remained, especially near the shores. There is frost in the Kara Sea, but it is degrading." But since there are thousands of pockmarks on the seabed it can mean that further degradation of the permafrost will lead to the appearance of new funnels on land. Where are the orifices located? The biggest orifice is located approximately 30 kilometers from Bovanenkovo (70°26’17.00″N 68°19’27.00″E), on the territory of a large gas deposit. The orifice's diameter is about 40 meters, but it is gradually increasing. Indirect signs indicate that the orifice could have appeared in spring 2014 or fall 2013. The second orifice (69°9’56.22″N 74°34’14.87″E), which, just like the third was noticed by deer herders, is located near the Antipayuta settlement and most likely appeared in September 2013. The third orifice (70°9’58.57″N 82°20’2.20″E) was discovered in April 2012, but only recently became well known. The second and third orifices are similar in dimension: their diameter is about 15 meters. One of the "new" orifices is located 10 kilometers from the deposit in Bovanenkovo.